Imagine you grew up in Senegal and moved to France as a young 21 years old spouse. Imagine you pursued a career as a social worker, reuniting youth at risk with their families. Imagine that you weren’t completely fulfilled nby your chosen career as you realised you the needs in your native Senegal, where the problem of street children was growing by the day, were much bigger than those in your community in France. Imagine you decide to go back home to try and help address the situation. Imagine you thought you could stay home a couple years and go back to France but you realised the problem was much bigger that what you had anticipated. What would you do? Would you go back to France to resume your old life, or would you stay in Senegal? And if you were to stay, what could you do to change the lives of these children? Today, I am inspired by Anta Mbow of Senegal. 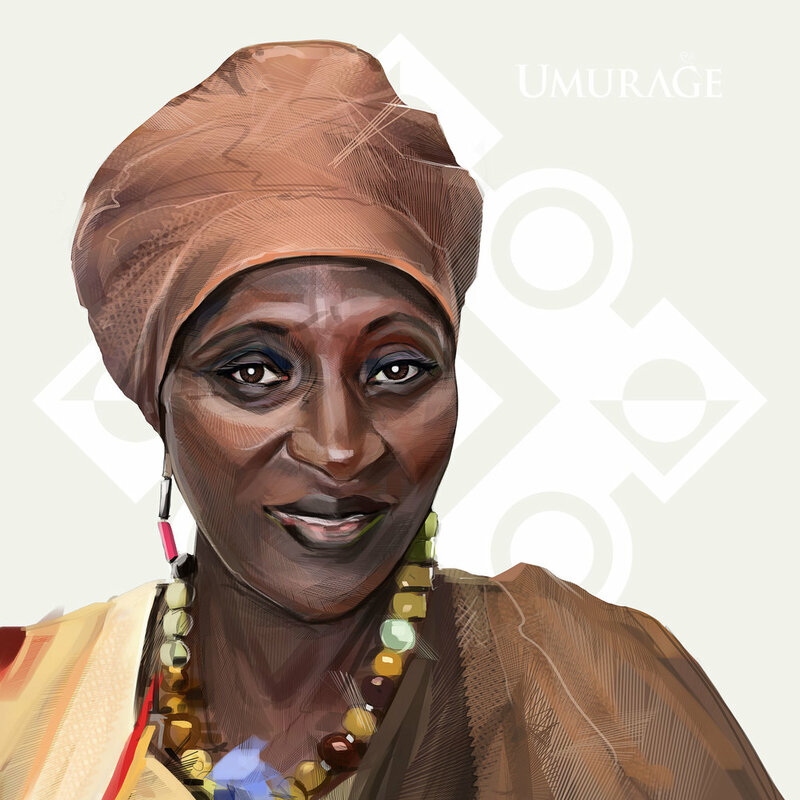 Anta was born in Dakar on August 05, 1951. The youngest of a family of four, she grew up in the colorful district of the Medina, close to the Avenue Blaise Diagne and Street 5. A little known fact about the Medina: its original name was 'Madinatoul Mounawara', a name given by the great Imam El Hadj Malick Sy, who opposed the name Ponty-Ville proposed by the colonial administration of the time. Medina is one of the oldest neighborhoods of the Senegalese capital as it proudly celebrated its 100 years in 2014. Anta studied at Medina Primary School before going to Saint-Louis, a town located some 264 km north of Dakar, near the border with Mauritania, to complete her Primary School Certificate. If the Medina can today boast of its centenary, Saint-Louis is soon to be 360 years old! The history and its colonial architecture of the former capital of what was called the French West Africa – including the famous Faidherbe bridge built in 1897 – earned it a place on the UNESCO World Heritage List. After obtaining her certificate, the youngest of the Mbow family returned to Dakar, where she attended the Papa Guèye Fall school. Anta has fond memories of her childhood, as the daughter of a businessman, whom she often accompanied to trade fairs, and a housewife. Their family home embodied the famed Senegalese tradition of Teranga, the welcome of strangers; the house was always always full of visitors, friends, family members and even foreigners. It is probably at this time that was born in her this sense of welcome and acceptance of others. "We called our house ‘the village’ as it was so crowded and strangers came to eat and sleep there." One of the adults who marked her childhood and from whom she inherited her love of her country's culture, was her maternal aunt, Mrs. Thiam. In the 1960s, her aunt created the first entirely handmade black doll, a creation that eared her to be introduced to the country’s first president, Leopold Sédar Senghor, the great Poet President and arts patron of Senegal. At the age of 19, the young girl married Doudou Leyti Camara, a former basketball player, with whom she moved to France in 1972. After a quiet life in her native Africa, the young wife found herself immersed in the frantic rhythm of French capital before the couple moved to Gien, in the Loiret, a city where she will stay for nearly thirty years and give birth to her four children. Upon their arrival in France, the young woman returned briefly to school to complete a secretarial certificate to have more chances of employment. Like many young immigrant women, even then, all she could get at first was a labor job in a factory, and then a gas station attendant before finally getting a job as secretary to in Gien’s towncenter. Although an office job could be considered a social success, especially after the labor jobs that were her lot in her early years in Europe, Anta felt somehow claustrophobic at the towncenter. Her personality and family upbringing made her a person who liked meeting people, getting to know them and helping them solve their problems. In his administrative post, opportunities for public contact were very limited, if not inexistent. After four years in that position, Anta decided to leave and go back to school. This time, she chose a field of studies that could more likely lead her to work with individuals rather than typewriters and files to classify: the social field. To that end, Anta moved to the twon of Orleans, where she attended a training school for social workers. Her training helped her land job in the social services of of Bourges, a city located some 70 kilometers from Gien. After three years, she returned to school to complete a certificate of aptitude that would allow her to supervise summer camps and outdoors centers. She was able to return to Gien, where she was offered a position of director of an outdoors center. She was finally in her element: working with young people! Anta immersed herself in her career with a lot of passion, even organizing trips to Senegal for at risk youth to help them experience a different reality. It was in those days that the young woman began become more aware of the growing number of street children in her native country. "In France, in my work as a social worker at the towncentre of Gien, I routinely reunited children with their family. Ironically, when I would go in holiday in Senegal, I would be confronted with the constant sight of children, poorly dressed, wandering the streets of the capital. Images that I could never shalke from my mind. " This situation weighed on her so much that she began to think about what she could do to help them. "I figured the problems I was fixing in France were a drop of water compared to what was going on back home. " In the year 2000, Anta decided to take a leave of absence, so she could stay home longer and try to help with the street kids problem. Herleave was only for two years, after what she was planning to return to her post in France. She first thought, a little naively or too optimistically, that this situation would quickly pass. "I always thought it was a phenomenon that was about to end. That parents, society, everyone would realise their mistakes of and that it was going to go away. " She began by preparing meals for the street children, but she soon realized that a few meals every now and then would not be enough if she really wanted to help them get off the streets and have a normal life. Instead of diminishing, the problem only seemed to worsen and the number of beggers to multiply. Most of these children were talibés, the boys sent by their parents to Koranic schools. These children are supposed to learn the Koran, but more than 50,000 of these young boys find themselves forced by their masters to become panhandlers so they could bring back food or money. "It's a system of exploitation of children, by these false marabouts, these people who call themselves koranic teachers. The reality is that they will bring in children to exploit them, and that is a real disaster . " Anta decided to create a shelter, a place where children can come to find refuge. "I don’t like injustice. What I saw on the streets of Dakar, I found it unfair. Children hanging out in the streets, left to themselves! What my own children had, all children should have: a normal children’s life. When I left Senegal, all that did not exist. " The stories of these children were overwhelming. Some children were practically treated as slaves. They were forced to bring in a certain amount of money every day and when they came home empty-handed, they were victims of physical abuse. They also had reports of children locked up at night so they would not run away. The first person to help her was her friend Valérie Schlumberger. Anta and Valerie had met a few years earlier through her brother, Serigne Babacar Mbow. Serigne had also lived in France before he decided to return to the country in the 1980s to create a project in Diourbel, the region where the Mbow family is from. At the time, the region of Diourbel, which is in North-West Senegal, was going through a prolonged drought. The unsuing economic crisis forced the youth and the men to go and look for work in the big neighboring cities, leaving the women alone to take care of the children and the elders. It was as though the region was gradually dying, both economically and socially. In 1984, Serigne Babacar Mbow and his wife Aïssa Cissé Mbow decided to return to try to revive their community in danger. The young couple roll up their sleeves and set about their task to try and come up ideas of collective projects that could improve their community’s living conditions. Serigne asked his sister Anta, who was still in France at the time, to help him raise awareness and funds for his initiative, which she gladly accepted to do. Thus, at the same time as her work in the twoncentre, she worked as a coordinator for France and Switzerland for the Ndem Development Project, a position she occupied for nearly fifteen years. It was during these years at Project Ndem that she met Valérie, a French diplomat based in Dakar, with whom she was going to develop a lifelong friendship. Anta had come back to Senegal when Valerie was leaving the country and going back to France. When Anta told her what she was trying to do for the street children, Valerie was excited and vowed to help her mobilize support to create the center she dreamed of. The next step was to find where to build this center and how to call her project. As the phenomenon of children begging in the street was more astute in the city center, Anta wanted to find a place that wouldn’t require to take the children too far. It was in the Medina, the neighbourhood where she grew up, that she was going to find the solution to her dilemma. At the time when the young lady left for France, Dakar was full of cinemas that were the joy of fans of the big screen. Unfortunately, with the advent of DVDs and satellite dishes, this industry was gradually disappeared. The movie theaters, when they were not rdemolished to make roon for office buildings or condominiums, had been converted into warehouses or stores, sometimes keeping their facades like little memorabilia of this historic past. Others, such as the open-air cinema or the Medina neighborhood, were simply abandoned and had become squats for homeless people of all ages. Looking at this building in ruins that she had passed so many times without really any mind to it, Anta was now seeing in it the future, a space where children could come to find a real family. Anta courageously went to look for the owners to present them her project. To her big and pleasant surprise, they agreed to lease her the place and restaure the old cinema into a shelter for children of the street. It was going to be the first of its kind in the city center of the capital Senegalese. I told you that Anta had two problems to solve: finding a space or building a reception center and finding a name for her association. Finding the space was of course the most pressing of the two problems, and by magic when she set her sights on the old movie theatre, she was able to address both the space problem and the name problem. How? Well, I have purposely omitted to tell you the name of theold movie theatre near the postoffice office of Medina, but I can reveal it to you now: Cinema Empire! Anta decided to keep this name, a symbol in itself of how one can give a new life to something that was thought to be distroyed: her association would be called 'Children's Empire'. The shelter of Malick Sy Avenue – street named after the famed marabout of one hundred years ago who was called Medina – opened in May 2003, after a round the clock works that were made possible thanks to the generosity of her friends from France, especially Valérie whom Anta calls a true Senegalese of the heart. No one could recognise the squat that was there for the last 20 years: the historic building was painted in white and sky blue, the walls and doors were covered with drawings, a playground filled with games was installed in the courtyard, and the old movie screen was turned into a miniature theatre stage where children could take lessons or enjoy plays organized by the center. A universe so normal for a structure that takes care of children yet so surreal for children who have experienced a world at the extreme opposite of the happy scenesrepresented on the center’s murals and graffitis. Anta resigned from her position in Gien, to dedicate herself entirely to her organization. The beginnings were not easy. Although she gained some experience running a for-profit organization during the 15 years she represented her brother's association in France, she had to learn how to navigate the system of the country she had left when she was only 21 years old. "I had to ‘re-learn’ Senegal, a country I had left some thirty years before. Plus, in those early days, I was the animator, the educator, the mother, the housekeeper. Even the kids were helping when there was something to eat, it was the boys who cooked. " Little by little, things started to get in order and the Children's Empire became a more professional organisation. The center, which has a capacity of 65 children, aims at the care, protection and social reintegration of children living in vulnerable situations on the streets, regardless of ethnicity or religion. The children benefit from a total care (lodging, restoration, clothing, medical care) and enjoy activities of blooming (leisures, sports, excursions, animation etc.). The association also offers a minimum of education to help children reintegrate into society. Initially, the children came by themselves, often escaping from the clutches of the people who held them. "Kids would knock on our doors at 2am. They would say they are scared because someone is chasing them in the street. " Anta Mbow, who was called ‘The Mother Theresa’ of Senegal, and her association gained more notoriety, the police also began to also bring children found in the street. Even the state broadcast company, Radio Television Senegalaise (RTS), where people used to bring children who were lost, brought the little ones for her to help locate their families. Beggar children were often malnourished, ill and some suffered from physical and psychological trauma. To break with the system of informal guardianship of the Koranic schools, the association systematically seeks a temporary custody order for each child, a most valuable document issued by the Ministry of Justice. The Children's Empire has also learnt how to handle the problem of reuniting children with their families. "Most children who come to the Empire are asking to go home as they found themselves in the street by accident. " When the children ask it, the center's educators reach out to partners NGO, who help them find the families. "It is real ants' work that we do to bringing children to their parents' home, all these investigations and steps necessary to find families." Once the families are located, sometimes even in neighboring countries such as Mali, Guinea and Guinea-Bissau, it is necessary to be reassured that all the conditions are there to allow this return of the children. "Once the family is found, it must be voluntary for both sides. We know that the child wants to return, but do parents want and can receive? " Anta's team takes the children to their homes, taking the opportunity to meet the community to raise awareness and ask them to be more vigilant when people come to promise them wonders when they do not offer children anything other that a real hell on earth. The cases that realy break the heart of Anta are those of children from conflict zones, sometimes as far as Congo and Burundi, because of the impossibility of bringing them home! The Children's Empire was almost 15 years old when the Government of Senegal finally decided to tackle more decisively the problem that has undermined Senegalese society for more than two decades. In June 2016, the government launched a new "street child removal" program, the aim of which was to act against children forced into mendicity. Through this program, under the auspices of the Ministry of the Family, police and social workers conduct street operations. In the first year alone, more than 1,500 children have been recovered from the streets of the country's cities! Recovered children are then placed in a shelter run by the state – the Ginddi Center – or in shelters run by associations such as the Children's Empire until they find their parents or guardians. The government is also making more efforts to inform the public of laws prohibiting forced begging and exploitation of children. However, a 2017 Human Rights Watch report found that in one year of implementation of this initiative, progress was minimal and even reported dramatic situations in which hundreds of street children, who had been sent back to the homes, were returned by their parents to the same Koranic masters who had previously forced them into mendicity! In addition, no investigation or prosecution were ever launched against individuals involved in the exploitation and abuse of these children. In other words, the road is still very long! Thank God, her efforts are not in vain, as the story of the young Modou can attest of. Modou came to the centre in 2004. At the time, the young Modou Fata Touré was 14 years old and he had fled his Koranic school – called daara in Wolof, the most popular language of Senegal – in neighboring Gambia, because of mistreatment. For three months, he found himself begging and sleeping on the streets of Dakar. "It was not the life I wanted, I wanted to go to school, but my father took that way from me when he sent me to a daara. I ended up on the street", says Modou. One day, a passer-by advised him to go to the Medina, and look for the Children's Empire. The lady who opened the door and welcomed him in her house will become his second mother. He even calls her very tenderly "Mama Anta". Mama Anta practically brought him back to life, offering him lodging, food, clothes and above all a real education. When he arrived at the center, Modou was very withdrawn and often prone to fits of anger. This was unfortunately very common among teenagers who grow up on the streets. Anta says of these violent teenagers that they are angry at society for abandoning them. However, over the months spent in the Empire, he learned to trust again and to control his anger thanks to taekwondo. He also discovered the pleasure of reading, devouring every and any book he could get his hands on. Modou will stay at the Center for eight years. "The Empire was the beginning of everything," says Modou. “That's where I started to follow orders, to be responsible. I learned to read and write French. We were taught the Koran, unlike the daara, who sent us begging. I participated in all activities. My goal: to be the best. " One day, in 2006, this teenager with extraordinary acrobatic skills, discovered the circus through a workshop led by the Swedish troop Fan-Atticks. He was so amazed by their prowess, he decided on the spot that this would be his career as well. "Sometimes when I missed my family, I would hit the walls with my fists, I would hurt myself. The circus helped me channel this rage. " The following year, when the Swedish artists came back to the Centre, they found that the young man has taught himself new tricks. He was so talented, they decided to help him to go to train in their country. Upon returning from his training, the 27-year-old young man that Anta had welcomed from the streets 13 years earlier, set up his own troupe, Sencirk ', Senegal's first traveling circus troupe, and proudly made a performance at the Empire, juggling with hoops, making balancing acts under the applause of children who were also probably dreaming of the day when they would no longer be just 'former street kids'. In 2013, Anta Mbow was awarded the Women for Change Award, an award created by the Orange Foundation and the Women's Forum, in partnership with Marie Claire magazine, to showcase women as change makers and drivers of growth and change. enable them to develop their humanitarian projects for women and girls. In 2016, the Leral Group awarded her the title of Woman of the Year for her commitment to saving children. Tireless, Anta Mbow is thinking of extending her reach by creating similar centers the country’s biggest cities. She is also looking for funding for the construction of a center entirely dedicated to girls, the Empire of Girls. The Empire Girls Center will be the first center of the city of Dakar devoted exclusively to girls who are victims of violence, exploitation or in a situation of great precariousness. Since the creation of her association in 2002, more than three thousand children in difficulty have benefited directly from their care.